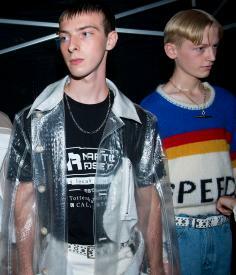 Scene setting: Martine Rose brought new meaning to the open-air show concept for S/S 2019, holding her menswear show at St Leonard’s Square, a residential street in North London’s Chalk Farm. Fashion and inclusivity have never been bedfellows, but Rose bought a new sense of community to her offering, the street’s residents and children sitting front row, watching from windows, sipping from bottles of champagne and enjoying a cigarette in the evening sun. The show’s neighbourhood location reflected the theme of Rose’s show, a love letter to London and its multicultural population. Mood board: the runway pounded to a up-tempo mash up of Nineties classics, like Massive Attack’s ‘Unfinished Symphony’, the garage classic ‘Gabriel’ by Roy Davis Jr ft Peven Everett, the Stone Roses, and a blaring range of ska, jungle and drum & bass. Rose’s collection nodded to a lad who has matured through different dancefloors and club scenes, and accumulated a wardrobe transcending genres. Piling on Nineties rave multi-coloured hooded sweatshirts, neoprene cycling shorts, Eighties denim, leather anoraks and puffy tailored jackets. The look was vibrant and eclectic, louche, and as loud as the tunes getting residents and front rowers including Off-White’s Virgil Abloh in the mood for an impromptu street party.